I’ve been hard at work this week making a copy of William the Egyptian Hippo. This project was recommended by our friend Bryan Divers. 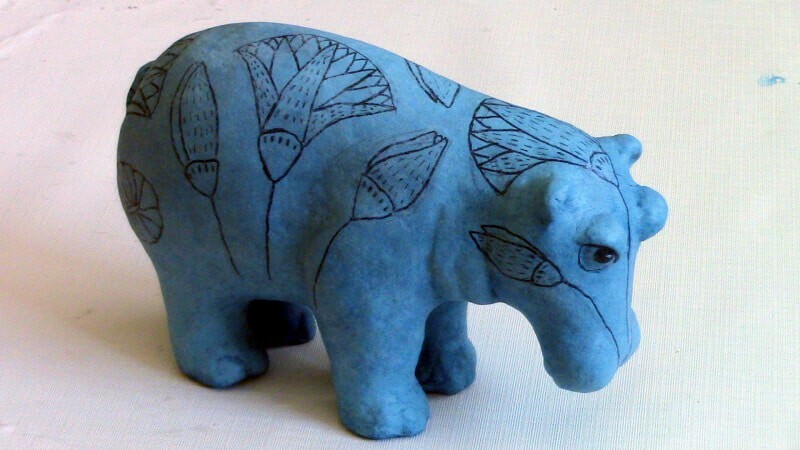 I have to confess that I’d never heard of this little blue hippo until Bryan mentioned it to me, but now I’ve fallen in love with this little fellow. I used the basic techniques found in my book Make Animal Sculptures with Paper Mache Clay, with a few minor variations. You know I can’t work on a project without experimenting at least a little! The only difference in the armature is that I used crumpled foil instead of crumpled paper to fill out the form. I started with paper, but the cheap masking tape I bought was so awful that I tore it all off and started over! There are more experiments (all successful this time) when I got to the paper mache clay and the final painting. I’ll tell you about those in the next videos. The one thing you really need to do before even starting this project is to go find as many images of William as you can find. William has fairly simple shapes, thanks to the original artist who created him over 3,500 years ago. If you look at the photos while adding your crumpled foil (or paper if you’re sticking with tradition), instead of just relying on my video, your final sculpture will come out better. You always want to use as many source photos as you can find. However, be sure you’re looking at photos from the same sculpture! It wasn’t until I started painting my copy of William that I discovered that the blue hippo that Wikipedia called William is not the same hippo as the one currently displayed at the Metropolitan Museum of Art. I thought it was pretty funny, myself – I’ve been working with an ‘imposter’ all this time. 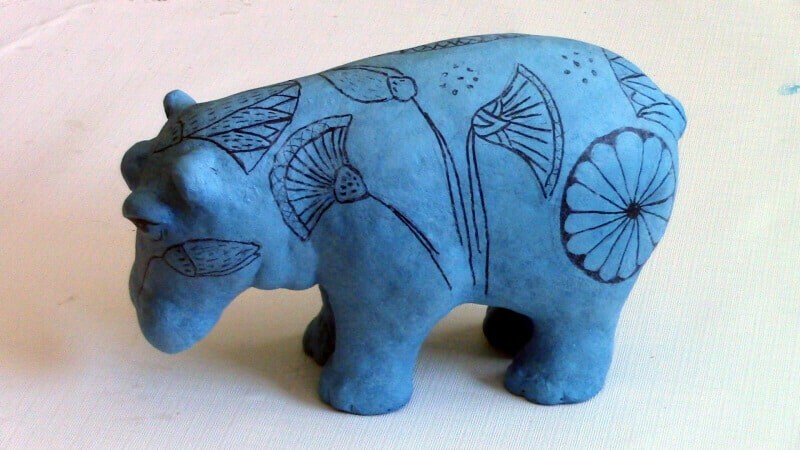 But it also made my final hippo more interesting – he has the lotus flowers from the Met on one side, and from Wikipedia on the other, and I like it! Click here for the second video in this three-part series, and watch as I add the paper mache clay. In the next video I’ll show you how I added a paper-thin layer of paper mache clay to the armature, and made it really smooth. A few people have asked me where I got the big glue gun that I used to stick the foil together on this armature, so here’s a link to it. I bought it three years ago from amazon.com. 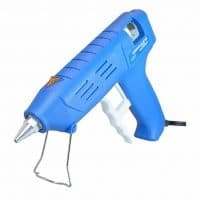 It gets really hot, so be careful of your fingers if you get one – but the glue sticks are huge so you don’t have to stop and replace them nearly as often as you do when using one of the smaller craft glue guns. William the hippo, after painting. 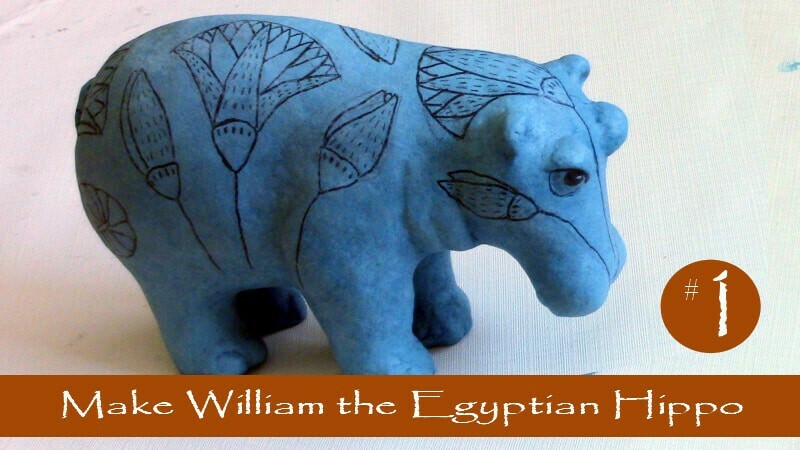 If you make your own copy of the Met’s William, the Blue Egyptian Hippo, be sure to come back and show him off here on the blog. We would love to see how it turns out! My very first one after watching your videos ~ so I want your free blue ? pattern ~ I don’t have a website ~ so how do I get it ~ have given you my email and name already ~ please let me know if you need anything else from me! Hi Lisa. 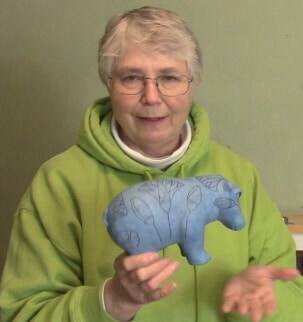 There’s a link in the blue hippo post that goes directly to the Hippo pattern PDF. You don’t need to fill out a form or anything. You’ll need a computer or device that will allow you to download and read a PDF file. Have you used hot melt glue elsewhere? Hi Jonni. It’s me Bryan. This is absolutely awesome!! Way better than I could have done. I downloaded your pattern and I’m going to try and copy it. It’s making me change my mind about paper mache clay. Could you e-mail me with a recipe please? I tried to read your article on it but I didn’t understand the recipe. Sorry about that. The realism on the eyes and the wrinkles on the underside of the neck are absolutely awesome. I could never do that with paper strips and paste. I have experimented with trying to develop a modelling medium from 1 cup of flour, 1/2 cup of salt and 1/2 cup of water. I have also sometimes added baking soda, white clay or ground up shredded white paper. Tell me, is your recipe anything like that? What I have found is that my recipe does not produce a medium that is firm enough to make a solid sculpture that stands, but I have wondered if it could be applied in thin layers to a paper and foil armature. What do you think? P.S. Sorry to jerk you around but I have a new e-mail address now. I left it in my email field below. I am starting a YouTube channel with it too. Hi Bryan – thank you so much for suggesting this project. I had so much fun with it. As for the recipe, you really need to watch the video on this page and then get the recipe that’s written below it. There are some tricks to getting the clay to come out right, and watching as it’s done is really the best way to get started. The combination of drywall joint compound and Elmer’s glue, reinforced with the paper fibers, creates an extremely strong skin for paper mache sculptures. So strong, in fact, that it isn’t easy to sand. As for your recipe, I don’t know if adding it in thin layers to your armature would help. It sounds very much like bread dough, without any form of reinforcement. Do more experiments, though, and let us know how it turns out. Bryan, if you use Jonni’s recipe, the clay will dry very hard. I make animals using her clay, cut out the insides to make piggy banks, and they are very strong. I have dropped them on tile and have never had one break. If I can be of any help, please let me know. Jonni’s videos ought to explain everything, though, really. Good luck. Please let us see what you are up to! That is beyond awesome. I love him so much. Besides just being wonderful, he would make a wonderful piggy bank; wouldn’t he? Thank you so much. An excellent suggestion. I know how awful bad masking tape can be. When I found a brand that worked for me (Scotch), I bought 15 rolls.